This crock pot dinner is really tasty, and the leftovers were delicious too. The recipe comes from the March 2009 issue of Cooking Light. I thought the original recipe called for way too much salt, so I didn’t add the salt, other than to season the beef prior to searing it, and boy am I glad that I omitted the rest of the salt, because the dish was plenty salty. My advice is to use the salt sparingly, because you can always add more after the dish is finished crocking. The recipe calls for beef short ribs, but I used just a boneless chuck roast, and it worked just fine. If your meat cut doesn’t have a bone, then I’d reduce the cooking time. Heat oil in a large nonstick skillet over medium-high heat. Sprinkle ribs with salt and 1/8 teaspoon pepper. Add half of ribs to pan; cook 2 minutes on each side or until browned. Place ribs in an electric slow cooker. Repeat procedure with remaining ribs. Add shallots, garlic, and ginger to pan; sauté 2 minutes. Stir in 1/4 cup water and curry paste; cook 1 minute. Stir in coconut milk, sugar, and fish sauce. Add coconut milk mixture to cooker. Cover and cook on LOW 6 hours. If using boneless chuck roast cover and cook on LOW 4-5 hours. Remove ribs from cooker; keep warm. Pour cooking liquid into a zip-top plastic bag and place bag inside a 2-cup glass measuring cup. Pour cooking liquid; let stand 10 minutes (fat will rise to the top). Seal bag; carefully snip off 1 bottom corner of bag. Drain drippings into a small bowl, stopping before fat layer reaches opening; discard fat. Stir in lime rind and juice, taste and adjust seasoning, if necessary. 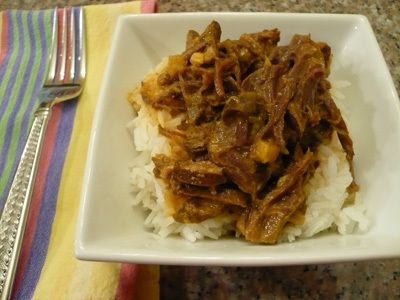 Shred rib meat with 2 forks; discard bones. Serve sauce over ribs and rice. Here’s a great recipe for leftover chicken or turkey or use a rotisserie chicken. The leftovers are great too! The recipe is adapted from the November 2009 issue of Southern Living. Heat 1 TBSP oil in large skillet over medium high heat; add eggs, and gently stir 1 minute or until softly scrambled. Remove eggs from skillet and chop. Heat remaining 2 TBSP oil in skillet; add onion and bell pepper, and stir-fry 3 minutes. Add cooked chicken and mixed vegetables; stir fry 2 minutes. Add rice, soy sauce, and chili-garlic sauce; stir fry 5 minutes or until throughly heated. Stir in eggs. 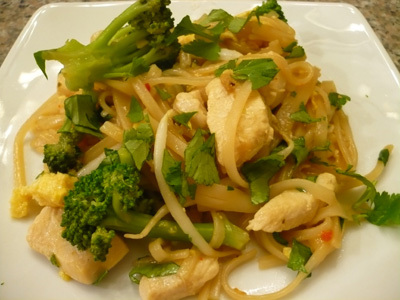 I love Pad Thai, and the nice thing about this dish is that it is quick and easy to make. It’s certainly a bit more adventurous than my kiddos are willing to try, so I just set aside some of the chicken for them, and they were happy with that. You could also skip the chicken and make this a vegetarian dish. 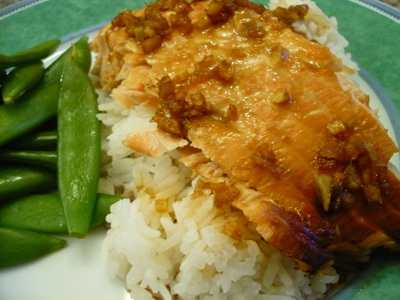 This recipe is adapted from a recipes in 30-Minute Suppers Winter 2010 by America’s Test Kitchen. Heat olive oil in a skillet over medium high heat. Add chicken and saute until cooked. Set aside. Meanwhile blanch broccoli in boiling salted water. Cook noodles in boiling salted water. After chicken is done cook eggs, stirring constantly until scrambled. Transfer to plate. Add water, soy sauce, lime juice, sugar, and chili-garlic sauce, and cook until slightly thickened, about 3 minutes. Add chicken, noodles, broccoli, and egg; toss to coat. Then add bean sprouts and top with cilantro. I picked up the America’s Test Kitchen 30-Minute Suppers magazine at the store, because I am always looking for quick and tasty meals to prepare. 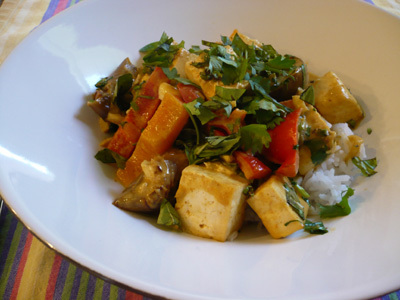 There were a number of recipes that caught my eye, and this tofu dish did not disappoint. We will certainly make this dish again. Recipe adapted from the Winter 2010 30-Minute Suppers by America’s Test Kitchen. Line a baking sheet with either paper towels or a clean kitchen towel; then place cut tofu on the towel; top with more towels; then top with another pan. Drain tofu for about 15 minutes. Once tofu is drained, remove the towels, spray the tofu with cooking spray and bake in a 400* oven until tofu is crisp. Meanwhile steam or blanch the broccoli in salted water. Whisk chili sauce, soy sauce, ginger and cornstarch in a bowl. Heat skillet over medium high heat. Add the chili sauce mixture and bring to a boil. Add the baked tofu and the broccoli and toss to coat. Serve over rice. We had some delicious looking eggplant sitting in the fridge that we bought from at the Farmer’s Market. I just knew it would be delicious in a curry. So I used my favorite Thai red curry recipe (made a few changes) and planned the dish around the eggplant. 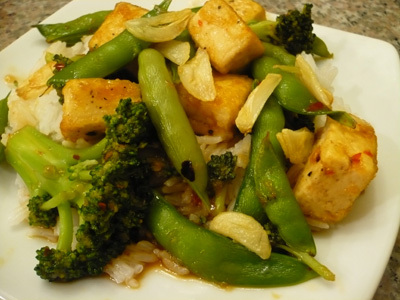 You could easily add chicken or beef, but I chose to go with tofu, and it was delicious! Line one baking sheet with 6 layers of paper towels or a clean dish towel. Cut tofu and arrange tofu on baking sheet. Top the tofu with 6 more layers of paper towels or a clean dish towel. Place another baking sheet on top of the paper towels fro 30 to 45 minutes–this provides the weight needed to extract the water from the tofu. Remove the paper towels from the tofu and spray the tofu with cooking spray and bake until golden brown, about 20 minutes. Meanwhile slice the eggplant and place on a cookie sheet. Drizzle with olive oil and salt. Roast in the oven until the eggplant is nice and soft, but still retains its shape, about 10-15 minutes. Heat sesame oil in a large nonstick skillet over medium heat. Add ginger and garlic; cook 1 minute. Add red pepper; cook 1 minute. Stir in curry powder, curry paste, and cumin; cook 1 minute. Add soy sauce, sugar, and coconut milk and bring to a simmer (do not boil). Remove from heat and add the baked tofu and roasted eggplant; then stir in green onion, cilantro, and basil. Serve over rice and squeeze with a lime wedge. 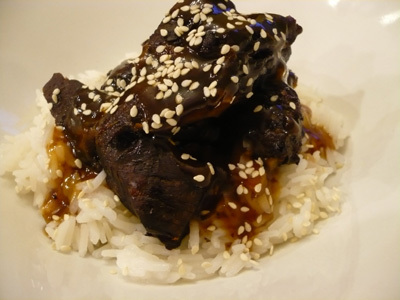 I found this recipe at Fashionably Foodie. I changed up the recipe just a bit (namely I added a lot more ginger…LOVE, LOVE, LOVE ginger!). -s even ate it with mushrooms…although I did remind him that he gave the ok to use mushrooms in Martin Yan’s recipe…and then he ate his dinner without complaining. 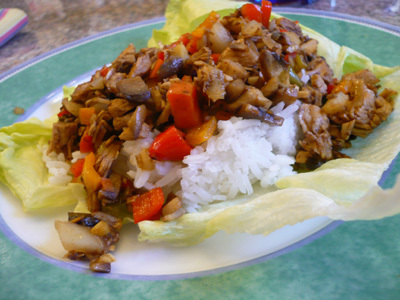 Combine the carrots, mushrooms, green onions, red pepper, garlic, and water chestnuts in a bowl. Combine sauce ingredients in another bowl and mix well. Heat oil and sesame oil in a nonstick skillet over medium high heat; add the chicken, carrots, mushrooms, green onions, red pepper, garlic and water chestnuts, and saute for a few minutes. Add 1/2 the sauce and let simmer for 10 to 15 minutes, allowing much of the liquid to reduce. Serve in lettuce with some hot rice. Use the remaining sauce as a dipping sauce. I found this most delicious recipe at Blisstree.com. Heather’s photo is soooo much better than mine, but since I loved the dish so much, I didn’t want to wait until I made it again to try taking a better photo. Not only is this a crock pot dish, but it is company worthy…yes you heard me right…I would certainly serve this dish to company! Mix soy sauce, sugar, oil, vinegar, ginger, garlic and red pepper in a small bowl. Place ribs in crock pot and then add the sauce. Cook on low for 5 hours or until meat is tender (if you use ribs on the bone, then cook longer). Remove meat and place on platter. Mix cornstarch and water in a small bowl. Turn crock to high and add cornstarch mixture. Bring to boil to allow sauce to thicken. This salad is delicious! So refreshing, tasty, and filling. The dressing is so flavorful, that it’s now our new favorite salad dressing. Great salad for a warm summer day. Preheat oven to 425 degrees. Coat won tons with spray and cut into strips. Bake on foil lined cookie sheet until crispy, turning once, about 8 minutes. 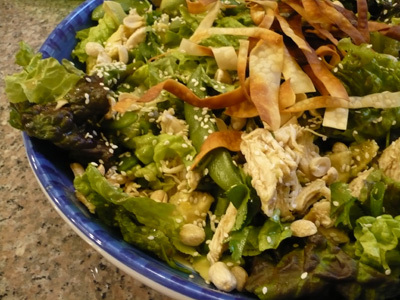 In a large bowl, combine the lettuce, chicken, oranges, avocado, sugar snap peas, cilantro, scallions, peanuts, sesame seeds, and won ton strips. Combine dressing ingredients in a small bowl; then drizzle the salad with dressing and serve. 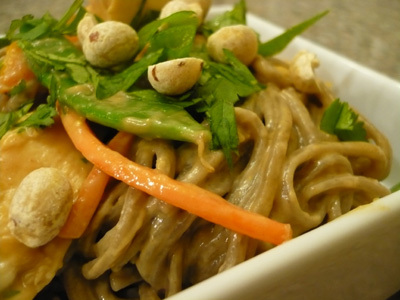 I wanted to to try something new and Asian, so I looked at my spicy soba noodles recipe, and created a whole new recipe that was delicious! 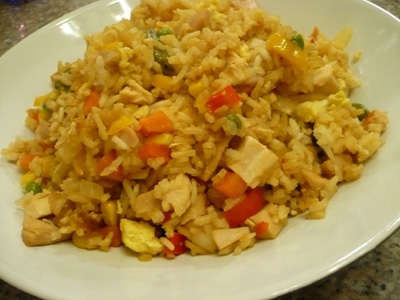 You can keep this dish vegetarian and add tofu or use leftover chicken and just cook up some chicken. Either way it will be tasty and satisfying…you’ll want more and more! Sauce: Combine peanut butter through crushed red pepper in a bowl; stir with a whisk until smooth. Cook pasta and chicken or tofu if using. Add sugar snap peas in the last minute of cooking pasta. Combine everything and toss to coat.